I was expecting buckets of juicy Saskatoon berries for my cooking and baking pleasure, but instead they walked through the door with an enormous supply of black currants. And that’s how this Roasted Turkey & Black Currant Brie Bites recipe was born. If you are looking for a quick (under 15 minutes), easy and unique appetizer for your next holiday potluck or party, give this festive holiday recipe a try. This easy baked brie appetizer was a winner in the 2015 E.D. Smith Holiday Share Contest! It’s a good thing I love black currants too. But even for someone who loves black currants, 5 ice cream buckets is a lot to deal with! And what do you do when you have too many black currants? Well, you make black currant jam, of course! I had never actually made jam before, so this was the best type to start with because it’s so simple and you don’t even have to worry about adding pectin. Fortunately, my Grandma always made it so I already knew I loved it and it had a real comfort food kind of vibe for me. But that’s not necessarily how everyone feels about black currant jam, and it isn’t always easy to find in stores, so you could substitute blueberry or blackberry if need be. However, black currant really is the ideal jam for this recipe because it’s a little more tart than other jams and goes really well with savory ingredients. This turkey brie appetizer recipe is a real boon during the busy holiday season because we’re busy enough, right? And it only takes a few minutes to throw together. It’s also a little different than the typical appies and casually elegant enough for any gathering. This is also a great recipe for using up your leftover turkey. Added bonus: you can make this appetizer ahead of time, refrigerate, then warm them in the microwave for 20-30 seconds before serving. Roasted Turkey & Black Currant Brie Bites are ideal holiday party appies! 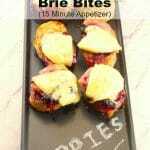 So, if you are looking for easy brie recipes, give this one a try! After my family’s black currant berry picking fiasco, I ended up with a lot of delicious black currant preserves and therefore lots of jam to experiment with. So, if you’re interested, try black currant jam in place of apricot preserves in this delicious and easy 5 Ingredient Apricot Chicken– it really tastes amazing! Make this unique and delicious easy turkey brie appetizer with leftover turkey. This crostini recipe only takes a few minutes to throw together. Preheat oven to 500 degrees (broil). Top turkey with 1 tbsp of black current jam mixture, dividing the ingredients between all the baguettes. Slice Brie and put 1 slice on each bite. Garnish with fresh herbs, if desired. *I used rosemary. If you’re looking for additional quick appetizers, give this 10 minute Healthy Yogurt Hummus a try! Thank you for stopping by my blog, Bernadine! I definitely share your passion for baking! 🙂 I enjoyed visiting your blog as well. It all looks so tempting! 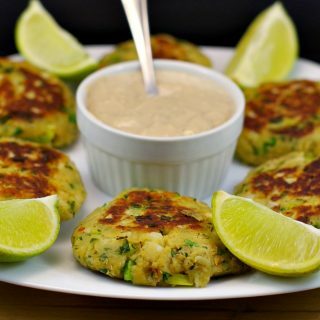 They sound gorgeous and definitely a great way of using up the leftover turkey! I’d love them for a light snack in the evening on Christmas Day. What a great combination of flavors and would be perfect for game day snacks as well. Love the brie with the jam. Thanks, Stephanie! I had a lot of black currant jam 🙂 But it really does work well together !